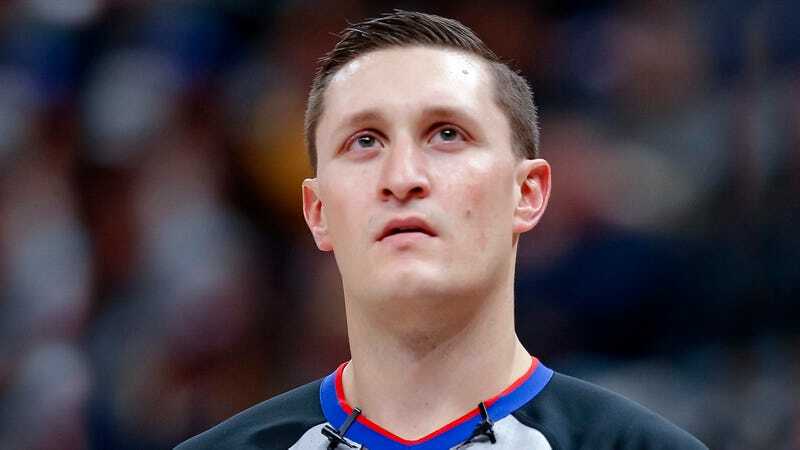 SAN ANTONIO—Staring into the distance with his mouth agape and sweat beading on his forehead, NBA referee JB Derosa was reportedly terrified Monday after seeing a depiction of his own death while looking under the replay hood. “JB was under there a while on what seemed like a routine call, then all of a sudden, he pulled his head out violently. He was shaking, and he had gone completely pale,” said fellow referee Sean Wright, adding that Derosa was in a fugue-like state and completely ignored him when he asked if he was okay, only to later reveal to team physicians that he glimpsed a brief, spectral vision of his future demise in between frames of an attempted block by LaMarcus Aldridge. “After I grabbed his shoulder, he turned around and just started muttering ‘No, no, how?’ as his lower lip trembled in fear. Then his nose started bleeding. We still don’t know what the call was.” At press time, a frantic Derosa was desperately trying to discourage the NBA from holding its All-Star weekend in Charlotte, NC this year.